After fifteen years traveling across five continents teaching creativity workshops, I’ve learned a few things about flying with paint, not forgetting crucial items, and how to make packing easier. The best tip I can give you: make a visual packing list. This is quick and easy to do, all you need is your camera phone or digital camera. In fact, if you’re in a hot hurry, which we usually are when catching a flight, you can photograph everything as you unpack it at your destination. Which is exactly what I did in the example, below. This same trick works for anything you need to pack. The contents of your electronics bag (no more forgetting your phone charger back at the hotel), your toiletry kit (I can never remember what I leave out when I can only travel with a carry on), or even your clothes, if there are repeat trips you make that are similar. If you are traveling with kids and have more luggage to track, a visual packing list, in the form of a photo or two, can be printed out and placed right inside the luggage, so it’s easy to keep everything in it’s place when you’re ready to move along. I don’t know if it’s just because I’m a visual thinker, but I find a simple photograph of what I’ve thoughtfully packed works better for me that a written list of items. How about you? If you try this, let me know. I’ll show you what my visual packing list looked like at the one of the retreats I lead in Mexico. I took a series of photos to help me pack for future workshops. The three front containers are all inexpensive cosmetic bags, which are great for small art supplies. You know the roll up bags they make for fancy cosmetic brushes? I’ve only used them for my paint brushes. Any type of clear, small plastic zipper bag works for me. I like to see into a bag before I open it (and so do our friends at the TSA). Go to our local drugstore cosmetics aisle (I love the one at Target) and go crazy. On the left, front, is my apron. A colorful, embroidered gem from Oaxaca, Mexico. I just adore these aprons. The container in the back is from Hobby Lobby, a simple, lightweight bucket-type, with pockets inside and out. I find it handy to have one main container to pile my most-used supplies into. Every time I teach, I vary what I bring, as I’m always adding new supplies. After each workshop, or trip, if it’s a personal adventure, I make notes on what supplies I didn’t use, so I can leave them behind next time. These notes can go right in your sketchbook or travel journal. Or…notated right in the photo description after you’ve uploaded the photos to Facebook or Flickr, or your iPhoto album. Pictured: just a small array of the rubber stamps I bring to share with everyone. I am not-so-mildly addicted to alphabet stamps. I store lots of my stamps in old cigar boxes, which do not travel well. At all. These poor babies got really beat up on the last trip, so I’ll be looking for another option. Even though stamp pads come in every color of the rainbow, my main color is black. The VersaFine brand is more expensive, but they last for ages, even when lots of people are using them every day. For the sketchbook visual journal process, these are my some of my favorite paints. The 2oz. bottles of craft paint are packed in zipper sandwich bags, which then go into a couple more plastic bags. This photo shows me exactly how much paint I brought, and what colors, for a weeklong workshop with 12 people. Everyone in the workshop brings some of their own, plus I supplement with the Mexican paint. Always, there is lots of paint left over to donate to a local school or to someone in the workshop. I use large bottles with no-spill tops (shown back, left) for items I use in my studio by the gallon, like gesso. Or else I’ll use a no-spill top on a full bottle of product if the top fits. So far, no problems with spillage. That’s what I did with the glazing liquid, even though you can’t really see it in the photo. After all these years of traveling with paint, I’ve had no bad paint spills in the luggage. Until this year…when a bottle of ink exploded. It was rust-colored ink, and bled through the suitcase. It looks like dried blood. Not something I want to cart through customs again. Note to self: ink does not travel well. Decorative clear tape, manilla tags, water-soluble oil pastels, big bag of ribbon scraps, more pretty paper and envelopes for our sketchbook making…each go into their own bag. I keep an empty box in my studio and am constantly adding fun stuff to it to bring to workshops. The mix is always different. Like a seasonal creative compost. The gallon zipper bags are my favorite packing item. This is not a commercial for ziplock, but don’t you think it would be fun if they wanted to sponsor an around-the-world with ziplocks packing challenge? Yes, please. The gallon size is perfect for storing 12×12 papers, magazines, and collage ephemera. I’ve bought more expensive organizing methods for my decorative paper, and always end up coming back to my trusty zipper bags. You can see the smaller zipper bags of paint bottles packed in a larger zipper bag. All of this and the other supplies fit into this large plastic blue tote that zips shut. Sometimes I use a large mesh zipper bag, the kind that are popular in Mexican markets. Both are sturdy and checkable. If I find new art supplies at my destination (I always do) then the plastic tote bag can be checked like regular luggage. Let’s see your visual packing lists! Great article. My son is an artist,too. He has hundreds of paintings. I will show him your article. I bet he will want to use my cosmetic bags. Thank you so much for sharing your article! In preparation for our Grand Adventure, I’ve fine-tuned my art supplies to one small, well organised satchel. Pencil cases, make up bags & ziplock sandwich bags are great! After seeing your supplies, I no longer feel as bad for taking as much supplies as I’m taking, in fact my art tools back is rather ascetic! 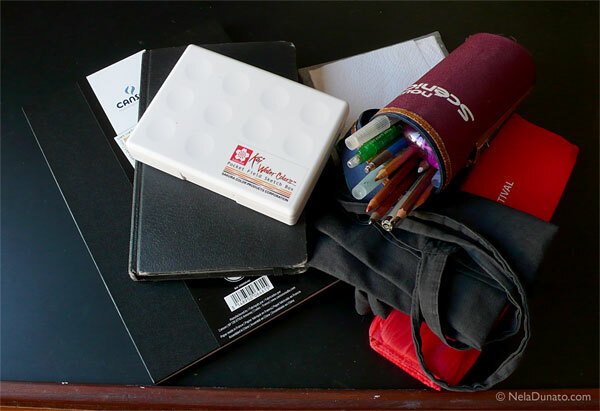 Here’s a photo of what I usually take on my vacations: http://neladunato.com/images/sketching-museum-equipment-small-4-blog-336.jpg – 2-3 sketchbooks, watercolor set, watercolor pencils, brushes, colored pencils (not pictured) and paper towels. If I did more mixed media, packing and traveling would definitely be more challenging! totally intrigued by how others solve this dilemma. I curse mixed-media baggage… somewhat often, I’m afraid. Though now that you mention it, I wonder what you pack when you go on solo explorations? Like what would your “essential” toolkit look like? Happy you had this on your email today because I must’ve not found you yet in 2012! What stands out from me from this post is how much I, too, adore cosmetics bags and ziploc bags, lol! What also stands out is the awesome idea of taking photographs of what you pack. This may just beat my packing lists in Evernote…that I carry with me from iPad to iPhone. I made that list whew I don’t even remember and adjust every trip. I kept forgetting floss, for instance! Glad I’m on your email list, and thanks for the ideas of how to reply to your posts. Congratulations on the 10th! What a great idea LIsa! Taking a photo of your stuff before, during or after you pack. I’ve always created lists which were nice, but I could never capture everything. Thank you for this idea. I’ve also signed up for your Creative+Practice class. Can’t wait to start! Hugs. I have booked seats for two pack mules to bring all of my supplies. Still waiting for their passports to arrive, but am optimistic. Otherwise, I’ll be checking and hauling way too much stuff myself. @Suzy So great to have you back at the retreat again. There is room at the inn for your intrepid Sherpas.